Understanding the earth-system, its components and the connections and feedbacks is a major endeavour of our time. This is driven largely but not entirely by the critical problem of climate change. Antarctica is a key component of the global system, and yet there remain large gaps in our understanding of the physical system that will be the focus of research to come. Many of the outstanding research challenges relevant to SSG/PS lie at interfaces between bio-geo-physical domains that require cross-disciplinary approaches within and beyond the physical sciences. Within the physical realm, processes at the interfaces between ice, ocean, land and atmosphere are critical to our ability to describe and predict the response to climate change. Outstanding uncertainties will require continued research directed at improving understanding of ice sheet dynamics, extracting climate records from the ice sheet, exploring processes and changes in sea-ice and ocean circulation and improving understanding of atmospheric dynamics and chemistry. A distinct component of physical sciences research in Antarctica is based on the unique properties of the continent which favour astronomical and solar-terrestrial observations. Much of this research is of wider human interest and not directly applicable to earth-system questions, although the solar-terrestrial component has obvious applicability to climate-related research. Beyond the physical system, the need to understand ecosystem impacts and biological feedbacks will continue to drive research of even broader cross-disciplinary scope. Biological responses to environmental change need to be informed by the physical changes, and increasingly we are aware that biological processes play a role in the physical system. SCAR Physical Sciences Standing Group will play an important role in identifying needs, and coordinating the research effort, along with the Geosciences and Life Sciences areas. 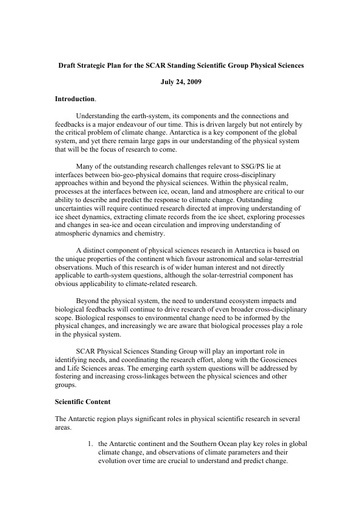 The emerging earth system questions will be addressed by fostering and increasing cross-linkages between the physical sciences and other groups.